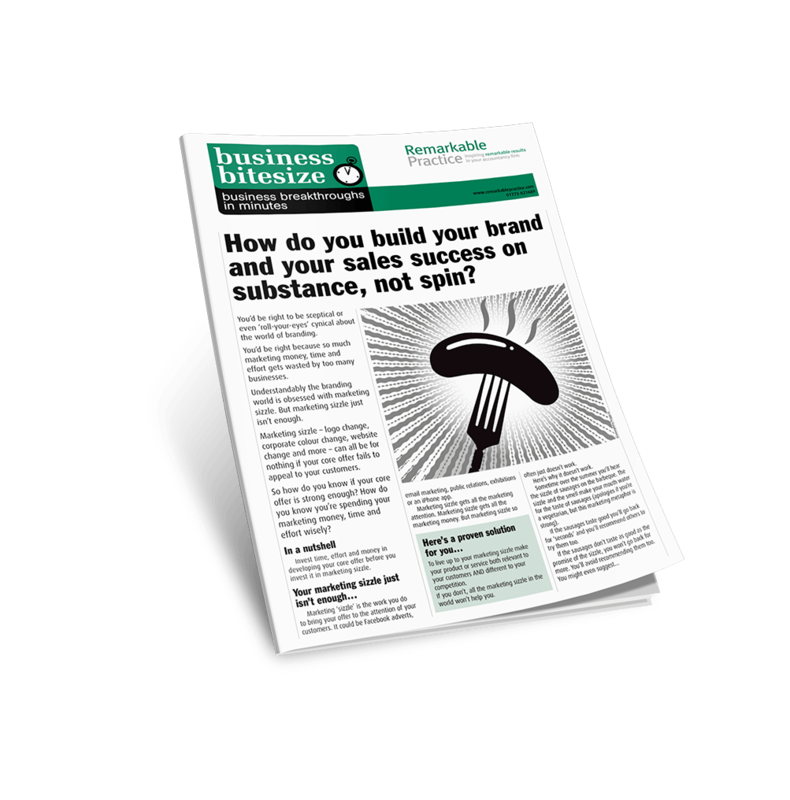 ​​How do you build your brand and your sales success on substance, not spin? invest it in marketing sizzle. ​Get your free report now! How many times in your accountancy firm have you spent time and money on the wrong things? For example, how much time and money has been spent on marketing your firm’s products and services without focusing on aligning your products and services with your clients’ needs and desires? It’s so easy to focus on the ‘sizzle’ when really the majority of the focus should be on the ‘sausage’. When was the last time you asked your clients how they feel about what you offer? When you ask your clients the ‘ultimate core offer question’ it can reveal a valuable way to better market your products and services. Established in 1869 and on our shelves since 1886, Heinz have a 64% share of the baked bean market. 1.5 million cans of Heinz Beans are sold every day! Because they asked their customers the ultimate core offer question. Question: What has frustrated you over the years about cans of baked beans? For most customers the issue was with the can not the beans. People complained that very often half the can is left and it’s messy and often gets thrown away. All because they dared to ask the ultimate core offer question. And most importantly they listened to the response from their customers. It’s good to take time to listen to your clients ever-changing needs, just like Heinz did. ​Focus on your sausage (your baked bean can) and not your sizzle (the logo and adverts) and dare to ask your clients the ultimate core offer question. Read more here.. Ignore checklists at your Accountancy firm’s peril! How strong is your accountancy firms promise to your clients?